Hello and Welcome to CAMELOT COLLECTABLES and ANTIQUES! We Specialize In Chic, Unique and Quality Gifts. W e have for sale for your consideration this exquisite. 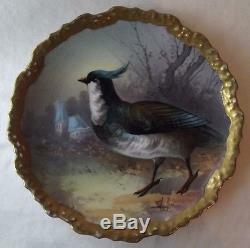 ANTIQUE LIMOGES FRANCE BORGFELDT/ CORONET HAND PAINTED GAME BIRD CHARGER PLATE. Dimensions: 10 -1/2" Diameter x 1-1/4" High. A Must Have For The Collector. This exquisite antique charger plate is made of the finest Limoges porcelain. Featuring a lovely hand painted game bird in blue and white. Painted in a fall landscape setting with leaves on the ground and a partial visible french country home in the background. 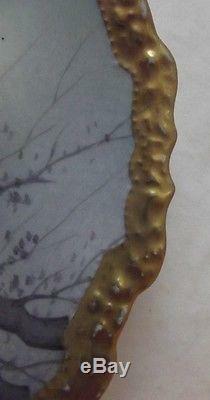 Wide 3/4 gold gilt rim with textured raise work. Signed by the famous French artist A. There are 4 holes in the bottom of the foot for string or wire for hanging. Our photos are the most accurate and are an important part. Of the description and condition. Most of our pictures are taken with a magnifying lens giving you a clear, close up photo. This tends to also magnify minor flaws on items which many times cannot be seen on actual items. Also, please check measurements given in listings as photos may make items appear larger than they actually are. On the bottom of this charger plate is. 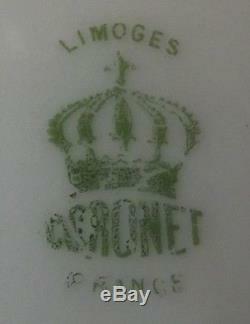 The Borgfeldt / Coronet decorating mark in green over glaze was used from 1906 to 1920. Dating this rare and exquisite plate to well over 100 years old. George Borgfeldt was a New York importer of porcelains with decorating studios in Germany and Paris, the Paris studio decorating mostly Limoges porcelains. Production included many plaques and collector plates richly decorated, often artist signed. Amazing Condition for its age. Excellent condition with no chips, cracks, crazing, loss of paint, or color. The gold gilt raised textured rim work does show wear where the gold has worn or rubbed off from age in places. 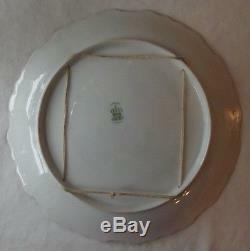 If you like this antique Limoges plate you might want to check out the other Limoges, France items we also have for sale. This Hand Painted Limoges Plate Displays Beautifully! This stunning plate will make a wonderful addition to your antique Limoges plate collection. Great gift for that Special someone. Thank you for your interest in our Store items and Come Again any time! P LEASE R EAD O UR P OLICIES B EFORE P URCHASING. By purchasing this item you are agreeing to our Policies and Terms. OUR POLICIES - TERMS OF SALE. We can not hurry the Postal Service! These charges are the buyers responsibility. Doing this is against U. Ask all questions prior to purchasing. Or request additional pictures, if desired. Most of our items are vintage or antiques and have been previously owned by someone else other than ourselves. We do not know if they come from a non-smoking or pet free home. We describe all items in our listings as accurately as possible. We will list any faults and damage to the best of our ability. Check out our other items. Add a map to your own listings. 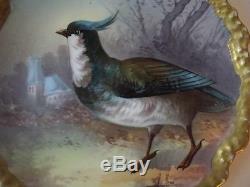 The item "ANTIQUE LIMOGES CORONET HANDPAINTED GAME BIRD CHARGER COLLECTOR PLATE SIGNED" is in sale since Thursday, November 7, 2013. This item is in the category "Collectibles\Decorative Collectibles\Decorative Collectible Brands\Limoges\Collector Plates". The seller is "sculley7748" and is located in Germantown, Tennessee.